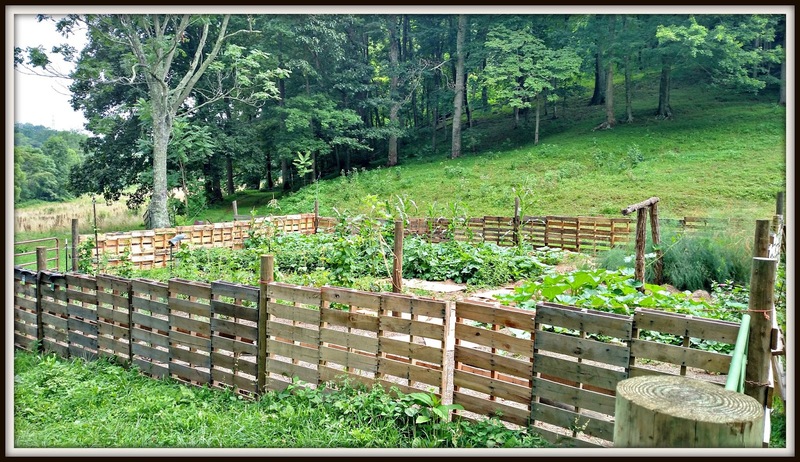 It took a long time, but the pallet garden fence is finally finished! I really like the way it turned out. Sunnybrook Farm was kind enough to help us get some more pallets to finish it off. It will be interesting to see how it holds up with time and weather. Hopefully it won't wear too quickly. I like being inside the fence. It's like my own little garden world. What more could I ask for? I really like the rustic look of your fence. Very clever. The fence looks great! I like the look of the pallets and such a clever idea to use them that way. You have a beautiful view to look at as you garden. It really looks good, better than mine as I really didn't know what I was doing when I started building. One thing that I did that really helped was that I found some old roofing metal and put that around the base to keep groundhogs and other small animals out but the fence strangely keeps deer out of gardens. They could easily jump over it but I have never seen one in the garden in the several years I have had it, they just don't like it. Charming! Hope it keeps out hungry critters. Great fence --but I am pleased to see such a healthy garden in the works... YUM... Lots of good eating will come from there. Love it, Lisa. I'm happy for you! Just fabulous Lisa! What a great idea, and I just know you are growing amazing delicacies for your kitchen there! It's swell! I love my garden room, too! I put a little table and 2 chairs in mine so I can just go in and chill. Nice job on that fence. What a good idea for a fence. My neighbor man makes lounges using boards on pallets. i love it... it looks perfect! What a neat and tidy fence! Phil and I are amazed! He said it is very cool. I want one even though we don't have a garden!! It still looks like a lot of work. But much less than with a traditional fence. You have the BEST ideas! Neat another Virginian Pallet-sade!!!! You need some cannon now I bet the boys can help with that. I love it, it turned out great! It's cool! I love how it looks AND it's functional! Pretty sharp looking. I don't know if you have wild hogs there like we do, but it should keep them out if you do. And even if you don't, from an aesthetic standpoint it's really nice. It looks very sturdy and nice. I'm amazed at all the things you can do with pallets. That turned out great. My former neighbor had the cutest planter made from a pallet and a blog friend's son painted a flag on a pallet for July 4th. I wonder if you could get some tarps, or car covers to cover them up for the winter? They could probably be staked down. Then it would last longer. Fantastic! I hope it keeps all the veggie eating critters out. It looks great! It's neat to see discarded pallets re-purposed like this. Pallets can stack up and become an eye sore and rotted mess in some places. This is a terrific use of them, good job! That's a lovely fence!!! Good for you.